​Huskies pulling sleds. Michelin Man looking suits and tennis-racket shoes. Frost encrusted eyelashes under a fur-trimmed cowl. Even if I had to survive on seal blubber, the idea of a polar expedition always seemed enticing. 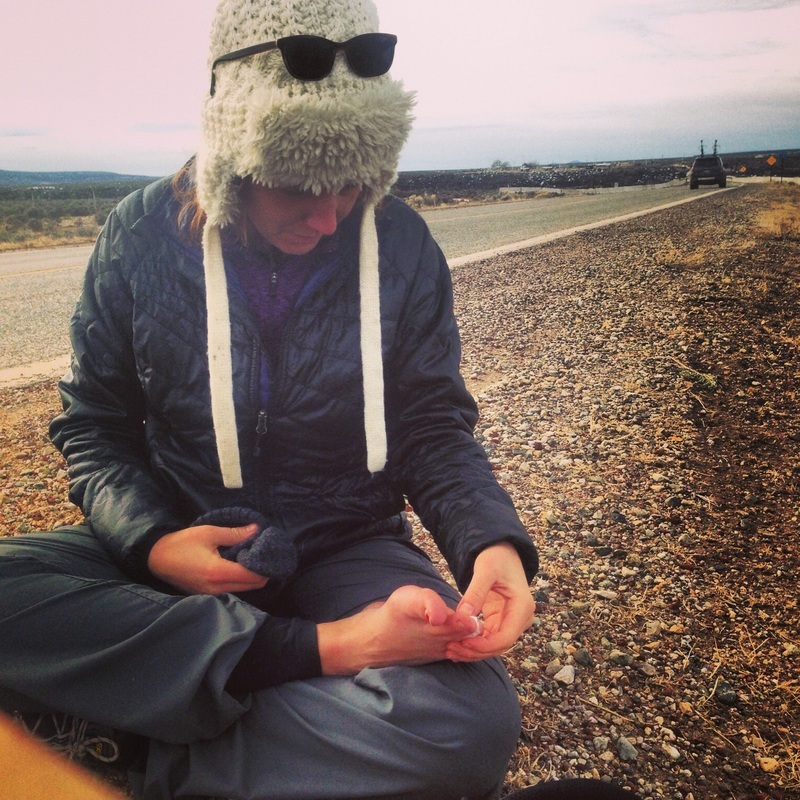 But once I experienced walking in northern New Mexico for three days in slightly freezing temperatures and just a little snow, I questioned my desire to learn survival skills in the arctic. I’ve never been a very practical person but since I was about to embark on an extremely ambitious adventure, research coupled with some field-testing seemed imperative. I was in luck. 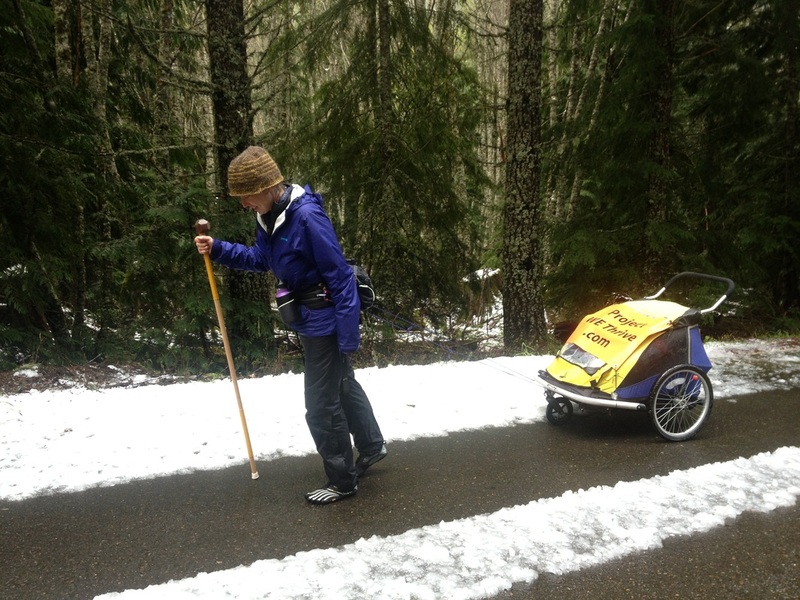 A man who had walked twenty thousand miles was currently crossing the South West of the US. Just a few states away from my home but a long plane ride, a hitchhike and a bus ride later, I was meeting up with him to pick his experienced brain and get a taste of being on the road. I made it to the restaurant, the only one on the outskirts of the Jicarilla Apache reservation. Although I was determined to walk the full six miles from bus stop to café, the sun was setting and I didn’t want to miss Karl’s nighttime routine. I was there to learn the tricks of camping along the roadside, especially how to set up camp in the dark. An elderly couple stopped to see if I needed a ride. I normally don’t like hitchhiking but with night approaching I gladly accepted. I crunched between distended garbage bags and boxes of discarded batteries. It appeared that they had very little; even their gas tank was close to empty. I began thinking they might ask for money so I quietly pulled out my wallet and began searching for a few dollars. I heard change rattling in the front seat while they began a conversation. As I opened my mouth to offer a few dollars in exchange for their generosity, the woman turned to face me with a fist full of change. Feeling obliged but resistant to taking any money from them, I held my palm out and with a smile she gave me several dollars with of quarters. When we reached the café Karl was waiting in, the elderly man insisted on carrying my bag inside. So I insisted they join me for a cup of coffee. I had bought them a plate of fish and fries before they left. I didn’t respond with my long-term dream of trekking across the arctic (besides we were short the huskies) and I plopped back down in my chair, ordered another beer and asked every question I could about what it’s like to walk around the world. After I picked through how many pairs of pants he carries, what he eats for energy, and if he’d ever been assaulted in his tent (which is yes, in Columbia, and instead of being arrested he was offered shots of vodka) we moved on to a more personal subject; Love and relationships. “Are you in a relationship?” he asked while sipping red wine. Beer gives him a headache. “Yes, and I think we can make it through the time and distance.” I put on my ultra confident face even though my boyfriend and I had already entered the conversation of it not feeling right to stay together. We wouldn’t make the decision to sever the relationship until months later. “We’re different and it’s worth giving it a try.” That was all I could muster to his sour outlook. I was starting to see the emotional challenge that a walk so grand as his, and one I was planning on doing, can do to the attached heart. The sadness seeped from his mouth and loneliness was dancing in his eyes. The moment I saw an emotional curvature in his face he managed to change the subject and we began plowing through itineraries and equipment. The first night in the tent was my reality check. I could hear cars passing just fifty feet from our camp and not a single bush to block the headlights. I think Karl is fast asleep as I begin a silent sob. I don’t want him to hear me. I felt weak, exhausted and disheartened as I lay in my cold tent on a yoga mat and a sleeping bag for cool autumn evenings. My toes felt frozen and tucked in a fetal posture. I covered my head with my jacket and fell into a light sleep to the rhythm of my warm breath. Two days and twenty-six miles later, the sun is rising and I can hear his stove warming up. I stretch, and every muscle responds with a scowl and one calf throws a tantrum. I roll out of the tent, mainly because I can’t stand, and take a closer look at six fluid-filled blisters. I wrap them and find that my shoes are now too small for my newly swollen feet. 1. A polar expedition must have huskies. 2. If I can walk in socks during a polar vortex, I can walk anywhere. ​It began with a brunch at a friend’s house to get coffee and protein inebriated. 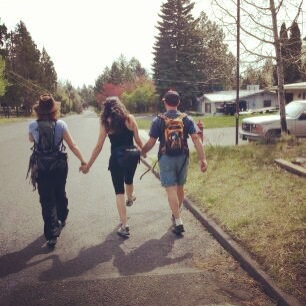 My friends Elyse and Josh joined me for ten miles the first day. We stood outside of Elyse’s home, did an honoring of the four directions and grabbed each other’s hands as we took the first steps on my world-spanning walk. A few friends hooted and hollered to give a crescendo to the kick-off. Then they headed home to their families while me and my two buddies were going exploring. First stop: Coffee shop. The first three days I had the luxury of going home. I would tie a cloth around a tree to mark my spot and my boyfriend would pick me up and get up early to drive me to my mile marker the next morning. I’ve always been a go-big-or-go-home kind of gal so although I had a few long hikes under my belt there was no way for me to know how my physical or emotional body would respond to my walk. I was hoping they would be just as thrilled as I was in my head about it, off to great distant lands with my Indiana Jones hat in tow. Day two, not only were my feet swollen but so were the pillows under my eyes. And I began the day by shuffling until I could eventually pick my feet up in a full swing-walking gait. I was wearing the ultra-thin Vibram five-finger shoes that I was convinced were perfect for my long journey. Repetitive kissing of sole to concrete began feeling like a fire was brewing under my feet. The pain initiated a break in every possible river, stream and handy water bottle to soak my feet in cool water. I’d lay with my feet towards the sky and closely investigate the blood running down my legs. For a few moments I’d think I couldn’t get up from that very spot. Like ever. I didn’t want to. If I had a pillow and blanket I could have convinced myself to cozy-up and sleep it through. I never did. But I always fantasized about it. The first night truly alone in the woods was magical. I had made it to a National Park that was nestled along the Santiam River. It was just turning into spring and as snow had melted, the surrounding wood was still soaked. I did attempt to start the fire but couldn’t remember what the hell that survival guy on YouTube said to do to start a fire in the rain! 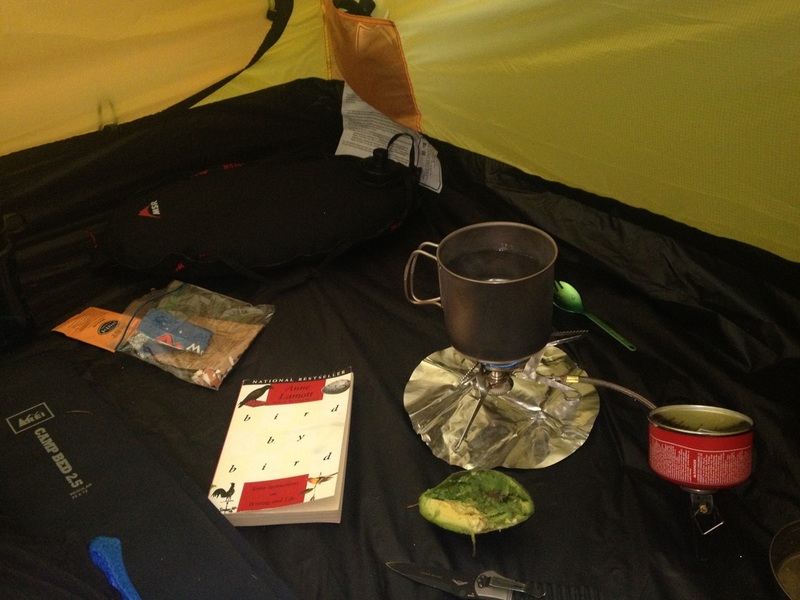 I made a cup-o-noodles and tucked into my sleeping bag with Ann Lamott’s book Bird by Bird. As little creatures scoured with curiosity around my tent, it felt like I was returning to a place I hadn’t been in a long time, the wilderness. When I think of the times I’ve gone hiking there’s always people and conversation around, where the focus was on listening to them rather than the sounds of nature. I hadn’t realized how much I missed and loved the sound of the woods at night. I fell into the cocoon of my surroundings. The next few days I witnessed some of the most beautiful parts of Oregon. Bend is an arid desert compared to the lush rainforest landscape of the western coast. I began listening less to my music and more to the river that weaved itself beside me. I was heading to Breitenbush Hot Springs, where ten of my closest friends met me to share on the soaking of mineral-rich water and to say goodbye. My friend Shireen played Unchained Melody as we huddled on the stone floor of the Buddha dome. My head cuddled on the chest of my boyfriend as my tears soaked into his cotton t-shirt and my hand gripped his arm. My godson climbed over our bodies as we all sang along…. I ran my fingers through his hair as he gripped tighter on my wrist. I wanted to ask him to wait for me. He drove home while I kept walking towards Portland. I would walk the length of the Great Sandy Desert grieving and learning the ultimate path to freedom: letting go.